So tell me Miss Morgan, where do you see yourself in 10 years? Um…well…that’s a good question! If you had asked Shawn or Shane Tiffany that 15 years ago, could they have guessed what blessings lay in store? 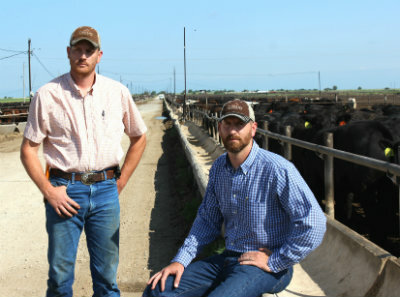 In December 2007, at 28 and 30 years of age, “the Tiffany boys” to the locals around Herington, Kan., became some of the youngest feedlot owners in the industry. “The Tiffany Boys” don’t really have defined positions in the feed yard but if roles were to be assigned Shawn (left) would be operations manager and Shane (right) would be business manager. Shane explains that he makes the promises and Shawn carries them out. Their father Steve was yard manager at Black Diamond Feeders for 14 years, so when former owner Doug Laue was ready to hand off the business that helped launch U.S. 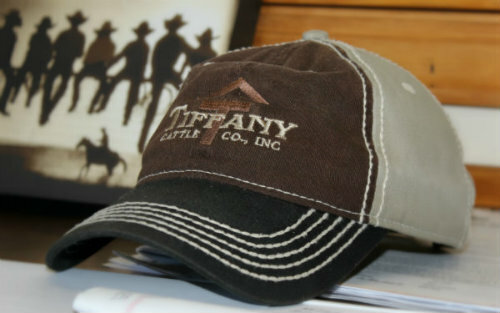 Premium Beef, he offered the chance to Shawn and Shane, now owners of Tiffany Cattle Co. However, this transition wasn’t a stroll through the alleyways. Recession was about to hit the country and advisors had warned the boys away, that it would be “crazy,” but they had faith. During that first crisis, they had eight customers and about 2,800 head on feed. Now they feed for close to 130 customers, stay full for most of the year, manage 2,300 head on grass and farm enough acres to not only spread feedlot waste, but grow all the silage and some of the corn they need. What used to be a WWII Army Air Corps base with 2,500 men stationed there has become a boarding house to more than 20,000 cattle fed by Tiffany Cattle Co. every year. Laue’s role as a founding member of USPB helped the Tiffanys with continuing market access, but it’s their level of customer service that underscores success. This quote is written on the white board in Shane’s office to remind him what the business is all about. They credit most of their success to the quality of cattle they feed but no matter how good the genetics, it takes people who know what they’re doing to create high-quality beef, and the numbers prove they can do it. In 2013, they fed 21,000 head that made 83% Choice, 5% Prime and including 39% CAB, averaging $58.80 per head in premiums per customer. In an industry built upon relationships, these brothers have turned customers into friends. And that’s the bottom line.